Ben turned to me on Tuesday and said to me, very seriously, "You know what, Mama?" "You really need to take Julia to Target." "Because, Julia wants to buy me a birthday present, and you only have four more days till my birthday!" "I'll keep that in mind, Ben." Never mind that in actuality I had five more days! And Julia's proud, too, because she assured him he'd get a loose tooth when he was five. She was beginning to think she'd lost her touch! I mentioned our around-the-corner neighbors Linda and Dennis around Halloween time. They are the older couple who live on the busy street around the corner and walk their dogs on our quiet street. They also brought the treat bags in a wagon through the neighborhood, with their tiny dogs Charlie and Bear dressed in costume. My kids are in love with those doggies, so we often talk in the front yard as they go by. We give them chicken eggs sometimes, and they repeatedly told us all fall, winter and spring that we can come swim in their pool any time we want to, even if they aren't home. Their kids are grown and gone, and they hate to see the pool go to waste. They welcome friends, especially those with kids, to come over any old time to swim. Now, in the cool weather, it was easy to say great, we will. 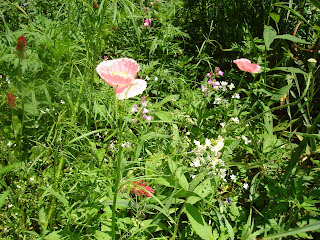 But as it became summer, I wasn't sure what to do. We have nice neighbors here, and we chat cordially when we see anyone outside. But it isn't like the fifties where we come into each other's homes, borrow sugar, or play cards on Saturday night. I wasn't sure about gregarious offers of pool use. But then again, I thought their offers were certainly genuine, and I didn't want to hurt their feelings, so yesterday when we had nothing to do (for the first time this summer, it felt like!) we got our suits and sunscreen on and walked around the corner with a carton of eggs as a thank you. So how is that for the best neighbors ever? The kids are so happy that we have a pool to go to when we want to swim, and I'm happy it's not our pool to care for! And it is a lovely inground pool with lots of comfortable furniture to lounge on (including a hammock and garden swing). We had a great afternoon swimming and playing.....I love it. Have You Met Mrs. Meyers? OK...you all know I am not a fan of housework. I do it because it needs to be done, but I get little if any enjoyment out of the act of cleaning--my happiness comes from it being over! That said, I love Mrs. Meyer's cleaning products. They don't do any animal testing, they all smell gorgeous, they are all biodegradable and made from plant extracts, and they just make me happy if I have to clean something. Target carries their products, but not at an very inspiring price. I've been buying the all purpose cleaner there in geranium (my favorite scent so far) because you can water it down so much that basically they can charge whatever they want. I fill a spray bottle almost to the top and add perhaps 1/4 cup of cleaner to that. 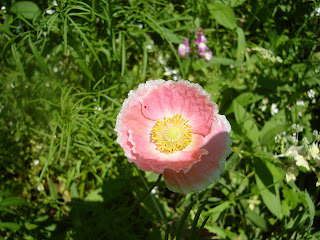 The smell is still beautiful and it cleans very well. And that way, I can let the kids spray the counters as much as they want to without worrying they are wasting this expensive cleaner or poisoning themselves. That said, I was shopping on drugstore.com the other day. I was looking for Mutt Mitts (which are degradable dog poopy bags, because we all know how much I loathe plastic shopping bags and all the damage they do to the environment!) and this site seemed to have the best price I could find. I noticed that the site gives free shipping for orders over $25, so I certainly wanted to take advantage and started poking around. I was ecstatic to find the entire line of Mrs. Myers for a lot less than Target sells them for, so I kind of went a bit berserk! Let's see, what did I get? In geranium scent, I got the laundry detergent, hand lotion, liquid soap and room freshener (which I will NEVER stop buying! It smells so good sprayed on the beds and near the kitty box!) In rhubarb, I got dish soap, countertop spray, window spray, and all purpose cleaner. Finally, in lemon verbena I got the surface scrub (like Ajax or Comet but natural). I was going to get the dryer sheets, fabric softener and I think there were even more, but I figured that was enough cleaning to get me started! I was surprised not to find a floor cleaner...maybe you're supposed to use the all purpose cleaner for that. So I ended up getting another all natural product for the wood floors. The best part is, I never left the house, I didn't pay shipping, and my products arrived in two days. Go drugstore.com! I am your friend for life now. 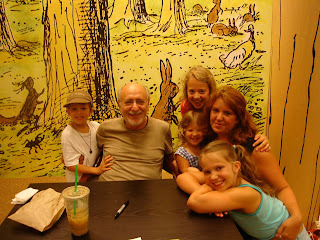 We had the pleasure of driving out to the Barnes and Noble on Nesconset Highway by the Smithaven Mall yesterday evening to see Peter Yarrow (of the folk group Peter, Paul & Mary) perform. 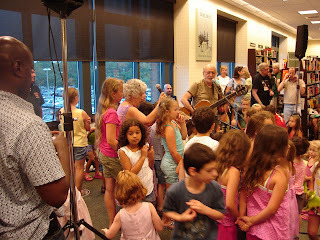 He has coauthored a picture book and CD of Puff, The Magic Dragon and nominally was at B&N for a book signing, but the real draw was the performance. 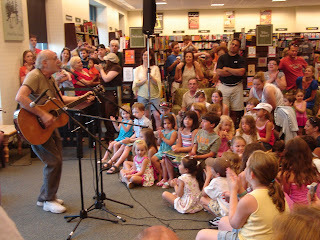 He sang songs and talked and related with the children watching in a way that was just magical. You could see everyone was hanging on his every word, the kids were smiling and singing and clapping along. He spoke of the present times being a return to the ideals of the sixties, where if we all just pull together we can change our world to one where peace and justice reign. That he held everyone in thrall is just the only way I can think of to express what went on. The line for the book signing was pretty long--we waited around 40 minutes, I think, and were about halfway down the line. Part of the reason it was so long was that Peter spoke to everyone, signed the book or mementos they'd brought, gave hugs and took photos. I honestly think he is about the most sincerely caring person I have ever had the pleasure to meet. It was obvious that he was genuinely glad to meet each person, not just going through the motions as I imagine many celebrities do. He looked right into your eyes as he spoke, he put his hands on the children's hair or hands, and his hugs were real rather than perfunctory. Just talking to him for a few moments was amazing. Anyway, I just wanted to share because it was a really fun evening, and I guess I'm a bit star struck. I think he put it best when he noted, "I wrote this song in 1959 (Puff) and the fact that four year olds know all the words never fails to amaze me." Everyone knows the Curious George series, by H.A. Rey. However, you may not be aware that George is actually in other stories of Rey's, one of which is called Cecily G. and the Nine Monkeys. I took this book out from the library because Emma loves Curious George, and of course Rey's illustrations are wonderful. I have always thought that Cecily was a bit of an odd story, but as usual, it takes the perspective of an almost-4-year-old to really cement that idea! "This story is just not realistic!" You might have noticed that I haven't posted in the last week--or is that hoping for too much? :) Anyway, the reason I haven't posted is that we had our annual visit from Matt's mom, Barbara, who lives in Georgia. Though we've had the best intentions of visiting her, it hasn't happened yet...the drive is far too daunting at this point in our lives, and airfare for six is out of our reach! So she makes the trek every summer. We picked her up last Saturday (the 12th) at LaGuardia, and basically didn't stop again till she left yesterday morning! In that week, we went to the beach, Splish Splash, the aquarium, the movies to see Wall-E, Greenport, Adventureland, and shopping. In addition, we ate out a lot, and Matt and I had two dates! The first was originally dinner and a movie, but surprisingly, we couldn't find anything we wanted to see. So we settled on dinner and going to the beach to watch the moon and stars over the water. We ate at the Meeting House Creek Inn, a restaurant that we have long wanted to go to, but never have before. It was a delicious dinner with a lovely view of the marina, the sunset and finally the full moon. Very romantic and lovely. The second date was to see "1968: Rock the World," an original musical at Theatre Three in Port Jefferson. It was a great show, full of laughter, tears and great classic rock songs (sung by the actors, not the original artists' recordings). We go there monthly for children's theater productions, which I adore, but it was nice to be there at night with just my hubby! After the show, we walked through Port Jefferson, and had some delicious ice cream and cappuccino at the Frigate, an old fashioned shop that sells ice cream and gelato, Godiva chocolates and fudge, and a myriad of other tasty treats. We'd like to go back with the kids for their family sundaes, where you choose the size (ranging from 4-12 scoops!) and then choose flavors and toppings. Sounds like lots of fun! After the ice cream we walked down to the water and watched the ferry for a bit, then meandered home. Anyway, the week was full of fun and went by really quickly. It's always fun to see Grandma! Rachel and Julia went to a wonderful science camp at Brookhaven National Laboratory this week....well, it seemed like the whole week but was actually only Tuesday, Wednesday and Thursday. Our homeschooling group does this camp every year, and I have always heard that it's educational and terrific fun. Plus--it's free! We never signed up for it because I always had babies and toddlers, though, and it begins at 9:30 in the morning, which doesn't sound very early to the average person, but for my family it's WAY too early! However, this year was the last year Rachel could do it, and I knew she and Julia would have a blast--plus each of them had a best friend going, so it seemed like I should just buck up and do it. Before I say anything--I will say I am very glad we did it. Both girls had a lot of fun, they got T-shirts, nature journals, knapsacks with a compass, those wooden snakes that twist back and forth realistically, bookmarks, balloon copters, rainbow 3D glasses, UFO balls--which show electrical circuits using your hands' warmth. They built K'Nex models of racecars, made a windmill, took a nature hike where they made plaster casts of animal footprints--foxes, deer and wild turkeys, mostly--had a scavenger hunt where they learned to use a GPS unit to go from place to place to get more clues and in the end found a beeping rubber snake, learned about box turtles and tracking animals for scientific purposes, and used tracking devices with radio waves. They also learned about generators, hooking wires to power a lightbulb by cranking it, and made rockets powered by Alka Seltzer. The counselors were great, they got to see a lot of friends they hadn't in weeks, and they learned a lot. It was really great. And Ben, Emma and I got to have some time together, which doesn't happen too often. We went to our favorite huge thrift store and got some neat toys, to a playground, swimming at our friends' pool, and on the last day had a morning at the mall. (Which doesn't sound very exciting, but we only go to the mall twice a year or so--it's 45 minutes away-- and they think it's a huge treat!) We ate lunch out and talked without bigger kids interrupting all the time. It was very nice. And now I come to the point of this blog entry. After just three days of having the whole family get up early--7:30/8:00, that is, and get everyone dressed, washed, brushed, fed and out the door by 8:45 or so, I was ready to collapse! Not that the kids were horrible about getting out; they wanted to go. But in Rachel and Emma's cases, we were forcing them out of bed an hour or more before they were ready to be awake (that goes for me, too!) and it was just not fun. We were only gone till 1:00 in the afternoon, but we had errands to run, and the days flew by so quickly--before I knew it, I had to make dinner and then it was bath and bedtime. So basically, this is just a love letter to homeschooling--because if I had to get the kids out the door every morning from September till June (and keep in mind, probably FAR earlier than 8:45!!) and then do the evening crush of homework, dinner, bath, family time and bed---I would go stark raving MAD!!! I pity all you schoolers out there! Julia has written another beautiful poem....I am so proud of her! it's just that you can't see. a diamond or a ruby. or what's inside a pocket of a coat up on a hook. not in a pot of gold. You'll find it every day. live his life like the rest of the chickens. media whitewashes with seemingly harmless phrases like 'the other side'. Oh, How I Love My Shiny New Fridge! We finally did it! 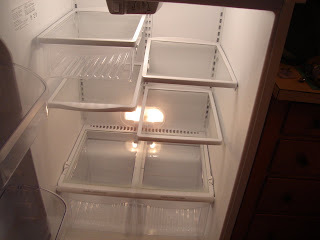 When we moved into this house almost two years ago, we knew the refrigerator was awful. But it was one of those things you ignore and ignore and ignore, till one day you can't ignore it anymore. A few months back we had the dryer serviced, and I was chatting with Bill, the repairman, as he wrote up my receipt. I asked him about old appliances, and he said that older washers, dryers and dishwashers were far superior to new ones--that as long as they worked, never give them up because most of his calls were to fix new appliances. It occurred to me to ask him how old he thought the refrigerator was (the house was built in 1950--we knew it wasn't that old, but it's hard for the layperson to tell!) because we'd wondered when we'd need to replace it. He examined it and said he thought it was 28-30 years old! Yikes! He dryly suggested we might want to replace it soon, as it was probably costing the gross national product of some small countries to run it. That was what pushed Matt over the edge. If you know him, you know he's all about saving the environment, conserving energy--and he isn't allergic to conserving money, either! We agreed that a new refrigerator would come after the floors were redone. So we were idly talking yesterday, and decided to look online to see if there were 4th of July sales going on...and there were...only till today, though. 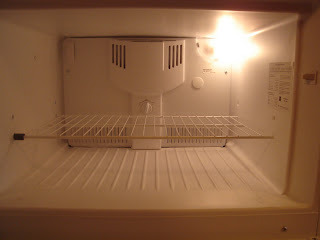 So we got ready and drove over to PC Richards, and within a half hour were signing the papers for a pretty Frigidaire. It was delivered today and I am over the moon! Now, for all you people out there who have new everything---NO, it isn't stainless steel. Our kitchen is gorgeous old wood, and old fashioned. Our other appliances are white, and stainless would have looked totally out of place. And NO, it isn't a side by side, or a bottom freezer, or a French Door model. It is your typical freezer on top model. Why, you ask? Because in our beautiful kitchen, the space for the fridge was carved out in 1950. 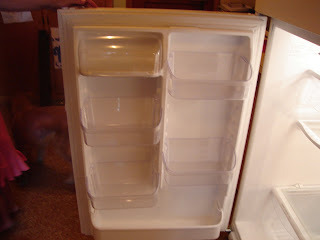 And they made refrigerators in few styles and sizes. In order to get one of the huge fancy ones, counters and cabinets would have had to be destroyed. And I can tell you that wasn't going to happen! Likewise, it has no ice maker or water dispenser, because it isn't next to the sink (and therefore the plumbing) and we wanted no worries with having to plumb it. We're simple people, and we don't mind pouring our water from a pitcher or actually making our ice in trays like the cavemen did. That said, is isn't the bottom of the line crummy fridge. It has glass shelves, one of which slides so you can put small items like yogurt there and see what you have. It has humidity controlled crispers, the shelves that are skinny so you can adjust them a multitude of ways, and the door--my favorite--has buckets rather than the typical metal strip that holds most things, until you slam the door hard and stuff falls out the bottom. It has a HUGE butter door, and the buckets move wherever you want, and they hold gallon containers, and two of them have blue rubber liners in case stuff spills (we used one in the bucket we're holding eggs in, for a cushion.) And there's one of those shelves with the strip along the bottom, just in case you get nostalgic. 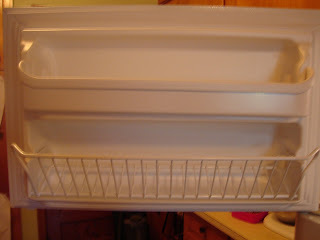 And the freezer has a neat wire basket that goes along the door and tips out at an angle, so you can put things like ice cream bars in it and they don't get squished or fall out when you open the door. It is bee-yoo-ti-ful. 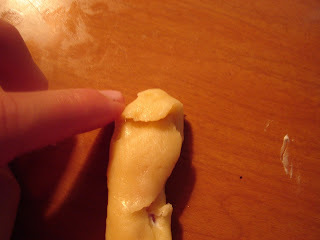 When the guys brought it in and moved out the old one, I was repulsed by what was under it--so foul. Cat toys, magnets, small toys, mounds of dust, pieces of dog kibble. Really gross. So I will be diligent about vacuuming under this one, I promise! I shed no tears when they hauled that old one out of here, let me tell you. Good riddance. And here are some photos, before we put anything in it. Admire the shiny cleanliness--you know how long THAT lasts! Boring old freezer, not much of interest here. Interior--the shelves adjust freely, and the one under the cheese drawer is the one that slides. LOVE that feature! Door---look how much space! All those buckets will hold gallon jugs, the bottom row holds a lot too. Look at that butter case! And imagine how many eggs go into one of those buckets! We have 23 in there at the moment, and there's still room for at least a dozen more. Awesome! 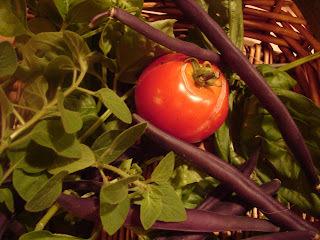 Today, I experimented with some simple kitchen ingredients, and created a great lunch that everyone loved. 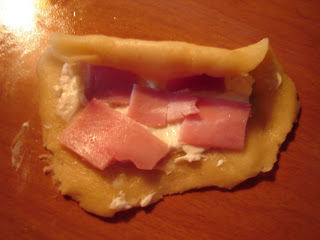 It consists of a ball of simple buttery tart crust dough, ham (deli, smoked, etc.) and cream cheese. 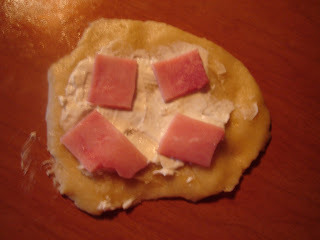 I had made tart dough, and then flattened it, spread a small amount of cream cheese over it, and then placed small squares of ham on it afterwards. 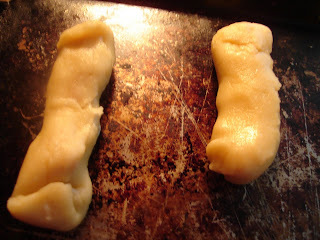 Roll it up, bake at 425 degrees for 10-15 minutes, and you're good to go! Here are some photos to show the steps one by one. 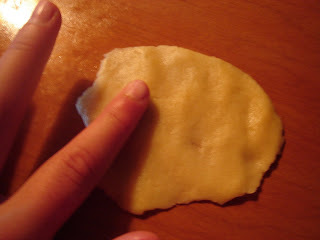 Step 1: Flatten a small amount of dough with your palm, with smooth it with your fingertip. 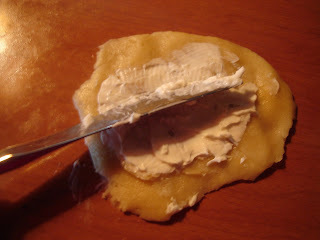 Step 2: Spread a small amount of cream cheese over the flattened amount of dough. Step 3: Add about 4 or 5 squares of ham onto the dough. Step 4: Start rolling the dough towards you, covering the cream cheese and ham as you go. 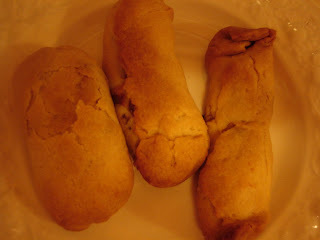 Step 5: The dough is all rolled up into a small tube filled with cream cheese and ham. 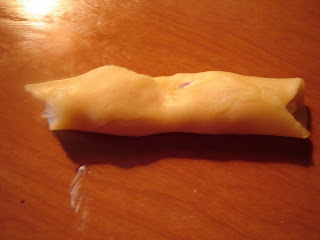 Step 6: Pinch each end of the tube together with your fingers. 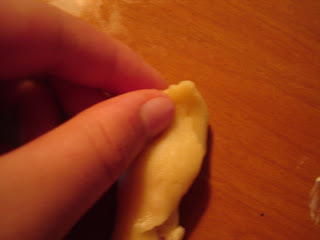 Step 7: Fold each pinched end over and press gently. Some time ago I referred to my dear husband as the King of Procrastination, in reference to house painting. Well, apparently we're well matched, because I am the Queen of Procrastination, in regards to homeschooling paperwork. Silly New York homeschooling laws require me to submit four quarterly reports and an annual assessment. They give us the dates the paperwork is "due," however, it is just a guideline to split the year evenly into quarters, because the law clearly states that we can set our own schedule as long as we hand in the required papers per school year. In general, I follow their guidelines though, because we follow the traditional September-June school year, and it's easier than scheduling it myself. PS: You might wonder what kinds of activities take precedence over doing these reports. Well, the answer is--everything! Checking email, talking on the phone, gardening, playing Crazy Eights, throwing a ball for the dog, checking the chicken coop for eggs, baking a cake, mowing the lawn, taking the kids for a bike ride, grocery shopping, even cleaning the bathroom--I have done all these things rather than write up this paperwork. Sigh. 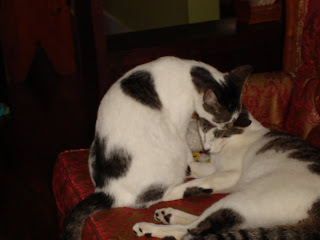 Who could resist these adorable kitties? And then he returns the favor. 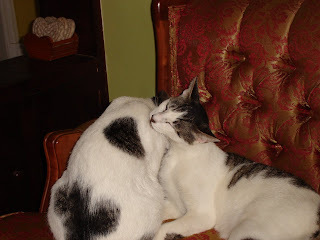 When they are not scratching at the furniture, they are just so cute I can't stand it! 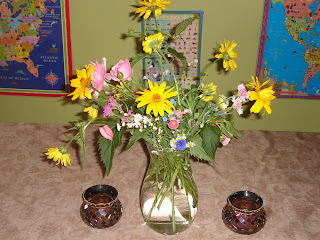 We picked our first big bouquet of the summer on Monday and took a picture of it...I am just getting around to posting it, but better late than never, right? 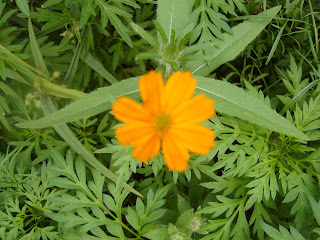 It was in one of the perennial or wildflower seed mixes I scattered in the garden. I absolutely love it--when you're looking at it in person it almost looks like it's made of paper. I am hoping there will be masses of them soon! So far I am very happy with the way the flowers are coming up, and am looking forward to more surprises like this little beauty. 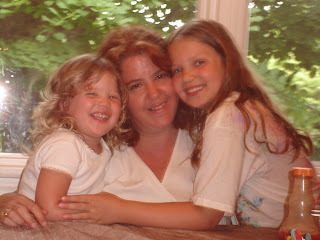 Ben was fooling around with the camera the other day and took this photo of me, Emma and Julia. I liked it, so I thought I'd share.